February 28 - April 1st. 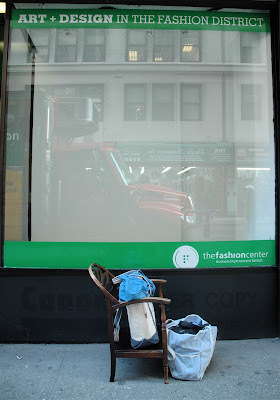 Shouldering my Ikea bags full of cup drawings at the end of last week, I wove my way from my art studio on 39th Street, through the trolleys, dollies and racks of clothes that are still trundled across the sidewalks in the Garment District. At #215 West 38th Street, men in boiler suits on a morning break let me into the back door of the Fashion Center building. I unpacked my stuff onto a table in the unused shop space behind the window gallery and rolled my sleeves up. The exhibition packs up small but this is only part of it. The giant Ikea bags are inside already. 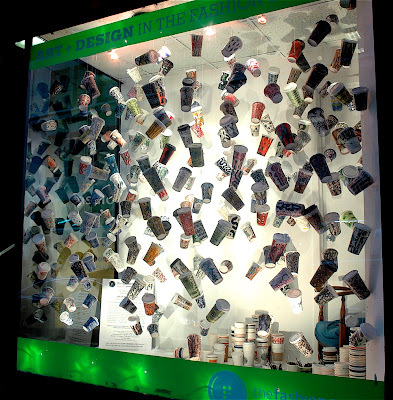 I then spent hours looping, tying and stringing cups together on clear fishing line before anything appeared in the window. A few trial cup sets go up. 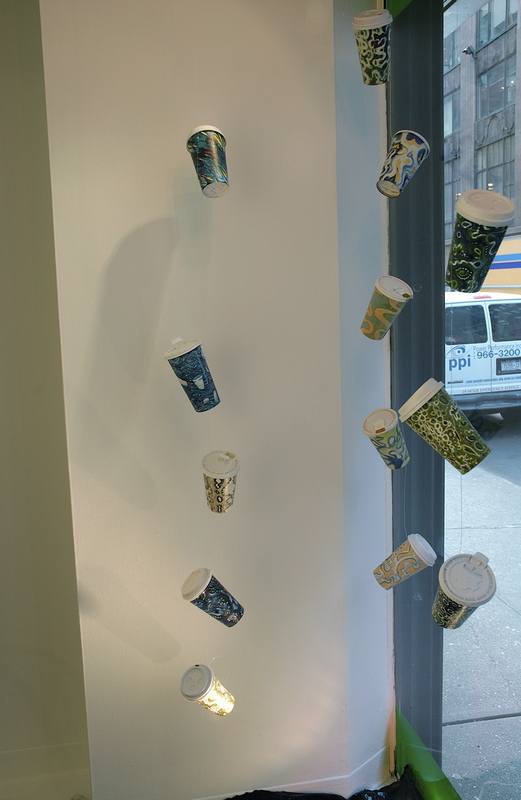 By the end of the first of my two hanging days, I had a lot of cups suspended and the window was beginning to have the explosive quality I was looking for. I dreamed of tangled lines that night. Day two was a race against the clock - looping, tying, stringing, up and down on the step ladder, in and out to the street to check the hang and to document the process. People were beginning to stop and take photos with their cell phones. A mother and son came by. "Mom, Look at all the coffee cups!" "Yes," said mom. "See, there's Starbucks and Lenny's and Bread Factory and deli cups. 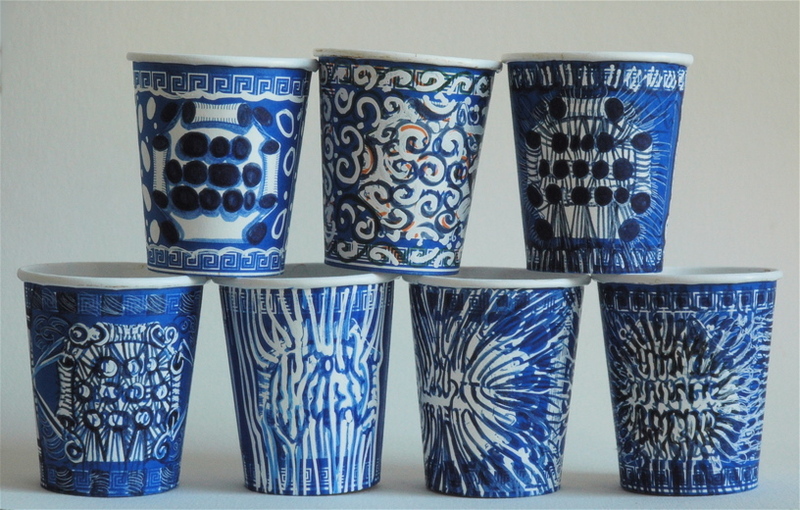 She drew on every cup". She turns to her son. "You could do that!" The side view into the window from the stoop. #1 "I never understand what they show in this space." #2 "Well, read the description in the window." #1 "I never understand the stuff they write there". #2 reads the panel out loud. #1 "But it's just coffee cups." 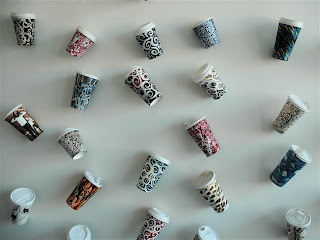 #2 "No, they aren't regular coffee cups. Look, each one is different." #1. "Did she design them?" #2. "She must have, like fabric. #1 Oh, OK. That's a lot of cups of coffee. The view from the Hypergraphic's seat. 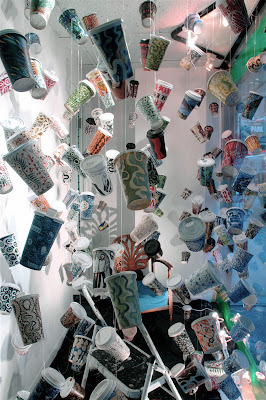 At 5:00 PM I was out of cups - they were all hung every which way, filling the space delightfully - and my time was just about up. I placed my chair - a small armchair with a wooden fan back which came from husband's grandfather's house in Scotland - then set out all my saved-up empties and my drawing materials. 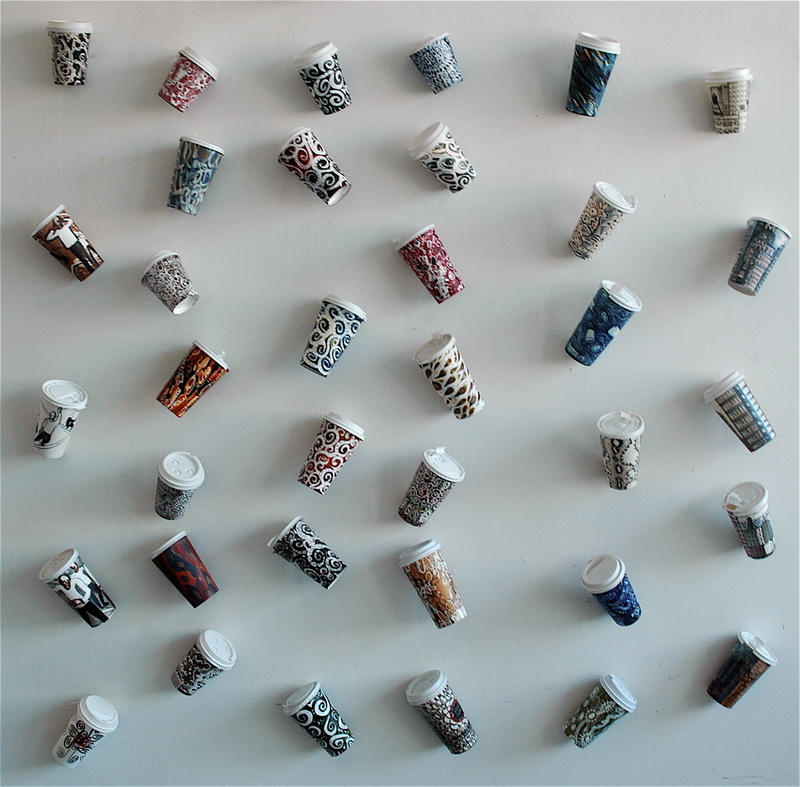 Monday I will start five weeks of sitting in the window every week day from 11:30 AM - 1:00 PM drinking my coffee or tea, drawing on empties and adding to the installation. Everyone is welcome to come and have a coffee break with me through the plate glass. But please don't smoke, I beg of you! 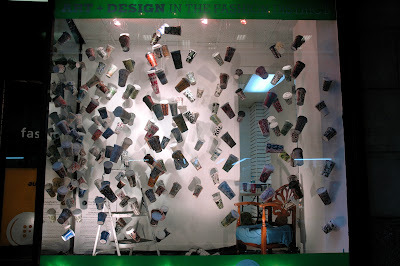 The view of the window from the street at the end of hanging. 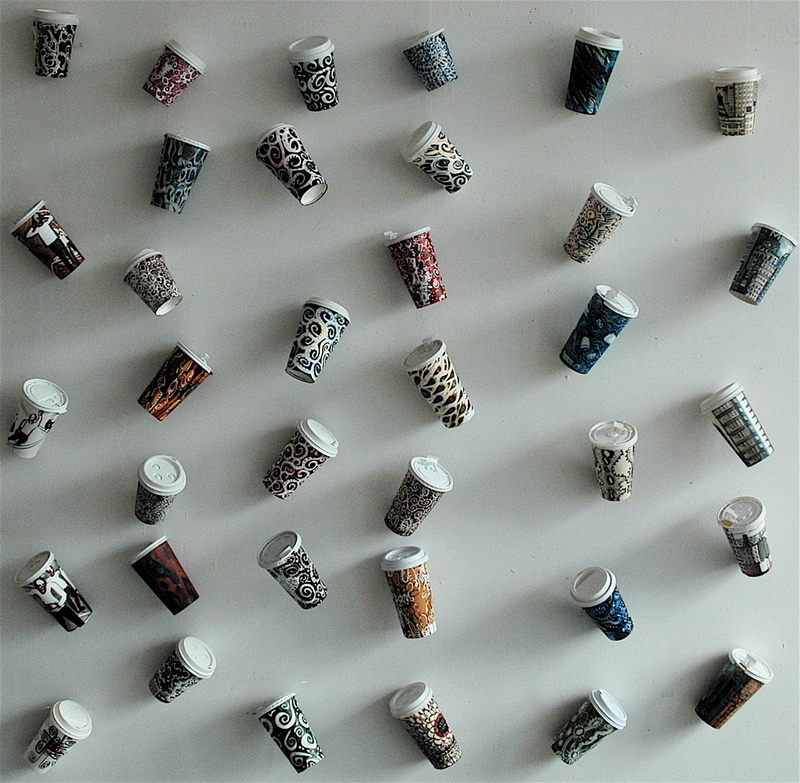 A year's worth of cups. I drank and drew all that!? Just before it was time for the security gate to come down at 5:30 PM, I took a last look at the window from the sidewalk, nearly staggering with exhaustion. A man carrying messenger envelopes stopped. "I saw you working on the window all day," he said. 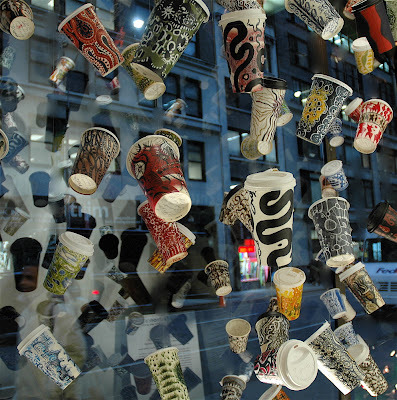 "The way the cups hang at all those different angles is so cool. This window is great. It's like art, or something." New Yorkers are always in a rush, on a schedule, trying to fit in too many things in a city where everything is too far apart. So how to explain the attraction here of Christian Marclay's the Clock, a video projection made up of time-marking moments from thousands of films and TV shows... with a running time of 24 hours!? 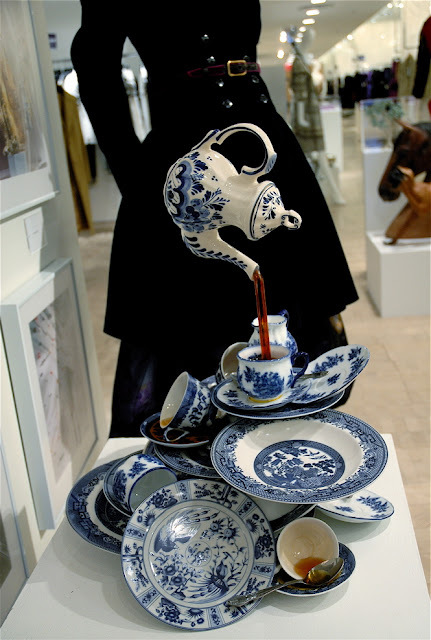 It played at Paul Cooper Gallery for five weeks. Two days before it closed an article appeared in the New York Times and suddenly the lines were hours long to get in. I decided I couldn't bear to spend more time in the line than I did watching the film, so, since I had left it to the last 24 hour screening, I went in the middle of the night. When I woke at 4:30AM last Saturday in the grip of my usual anxieties I thought, "what the heck, I'll go to Chelsea". I dressed in the dark, sneaked out of the apartment without waking the family and hopped a cab to 21st Street. I joined a short line, made up of some people ending their night, others beginning their day. We talked about the movie and its meaning, swapped stories of why we had left it so late to come and generally built a bond of camaraderie in the cold night air. I enjoyed the chat and was almost sorry when 20 minutes later I was ushered inside to take the place of someone who had baled. There, along with hundreds of other viewers, I found myself quickly drawn into a weird world of sleepers, waking dreamers, lovers, workers, families, all hermetically sealed inside their endless movie. The conventions of time compression are turned upside down as the banal, dramatic, suspenseful or funny time marking devices expand into a huge, seamless, kaleidoscopic almost-narrative. The whole is a clock marking real time. The video is a triumph of vision and sound editing, a hyper-tribute to the beauty of the movies, and a time collage of beloved actors aging, growing young and aging again. In the three hour segment I watched, hundreds of screen people woke up to clocks and alarms of all descriptions (who knew there was so many ways to wake up - some funny, some amorous, some murderous?). Between 6:30 and 8:00 AM, at first intermittently, then with ever increasing frequency, breakfasts flickered across the screen - toast popping, bacon sizzling, coffee brewing, coffee pouring, coffee being drunk. Finally, I could stand it no more - I fled to find my own. Outside, I was surprised that it was broad daylight, and was struck by the long vistas of the empty streets after so many close ups. Climbing the stairs to my apartment, I felt disoriented by the smell of bacon - my husband was making a movie breakfast, and greeted we with a kiss on the cheek. Life mirrors art mirrors life. The time was 8:15AM. I can't remember a winter like this. 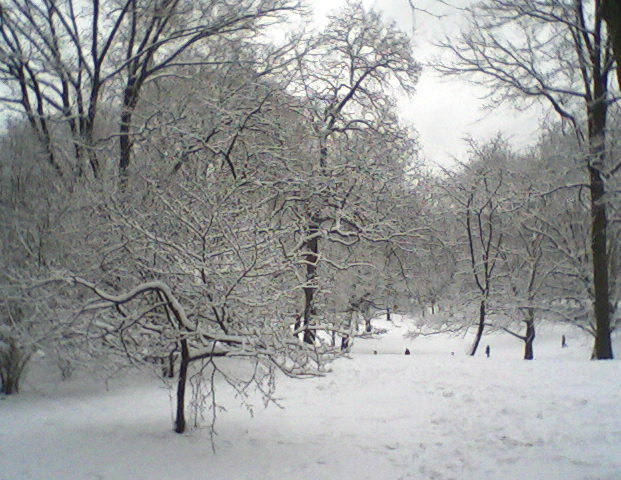 It has just been snow on snow on snow since the end of December. They say global warming is at fault: more moisture in the Arctic from melting ice, greater snowfall on Siberia with colder air above changing the patterns of the Jet Stream which in turn is dumping snow more frequently in weird places. There is only one thing to do - buy sleds. On a trip to Philadelphia in the post-Christmas blizzard we did that, picking up a couple of the plastic disk variety from a local hardware store. We used them for a day and then, although they cost just $7 each, I brought them back to New York City on the train. At the time it seemed annoying and absurd as I maneuvered them onto the overhead rack, but try buying a sled in New York City when you want one! Days and days of snow have fully justified the effort and we have been up to Central Park numerous times to spin down the slopes. 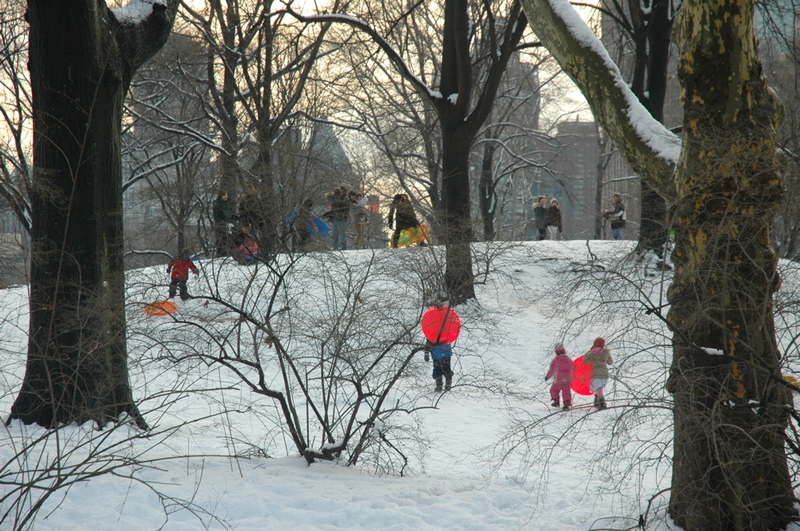 I noticed that other people are equipping themselves too and we see fewer impromptu sledders using cardboard boxes or trash bags. 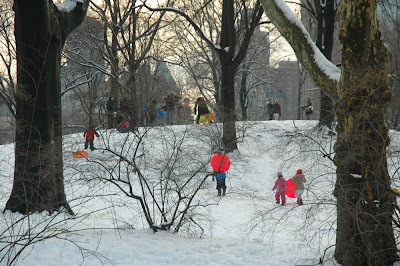 The problem with sledding is the wipe-outs and that moment when suddenly you are wet and cold. My youngest suddenly stopped having fun on Monday and we had to exit the Park quickly looking for lunch. Cafe Frida is just one block from the park on Columbus opposite the Museum of Natural History. We sat in the window, staving off the gray and white exterior with a welter of red walls, pink cushions and orange curtains. The food was fresh and brightly-colored and the coffee a real treat. My daughter was delighted with the warmth, the colors and the food. Settling back against the cushions, she declared, "this is where I live!" And when it was time to gather up our sleds and leave we had to carry her, protesting, out the door. I was cruising the notions stores in the Garment District in search of invisible thread, sipping a large cup of ginger and lemon tea as I walked. The question has been - will the cup drawings be stacked, lined up on shelves or suspended? I already have some clear fishing line from the hardware store and the suspended idea has been shaping up nicely. But, I thought, perhaps the line should be finer? Hence my quest. In just the second shop I tried on 38th Street, the Chinese sales assistant had what I wanted - a full spool, designed for sewing machine use. I handed over $6.99 and hurried back to the studio. 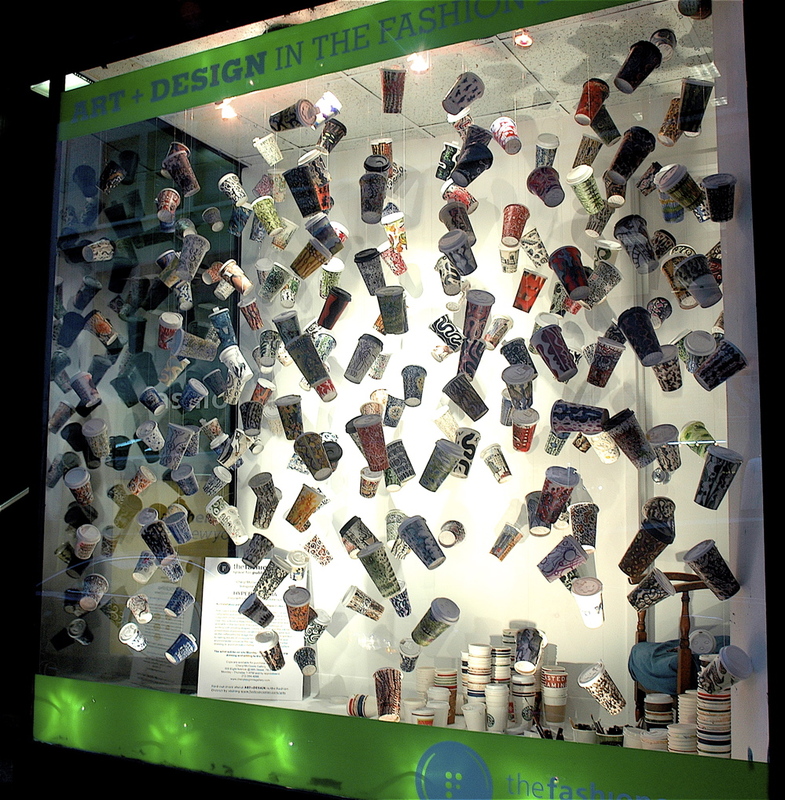 Standing by the window with a set of cups all lined up, I unwrapped my large spool and tried the thread. I could not break it. Good. Then I began to measure it out - very fine, very hard to see. Should be good. I started the process of measuring, looping, tying that I have developed this week. In no time flat, I was in a terrible muddle. The thread trailed down to the floor and as I tried to pull the length through the loops it caught somewhere, invisibly, on one of my shoes. As I tried to free it, it caught on the other. I pulled harder, it sprang loose, wound itself into a big knot and I could not see the line to find the end of it. Enough - there is clearly such a thing as too invisible! Into the trash went the spool and I turned once again to my 50 pound fishing line. 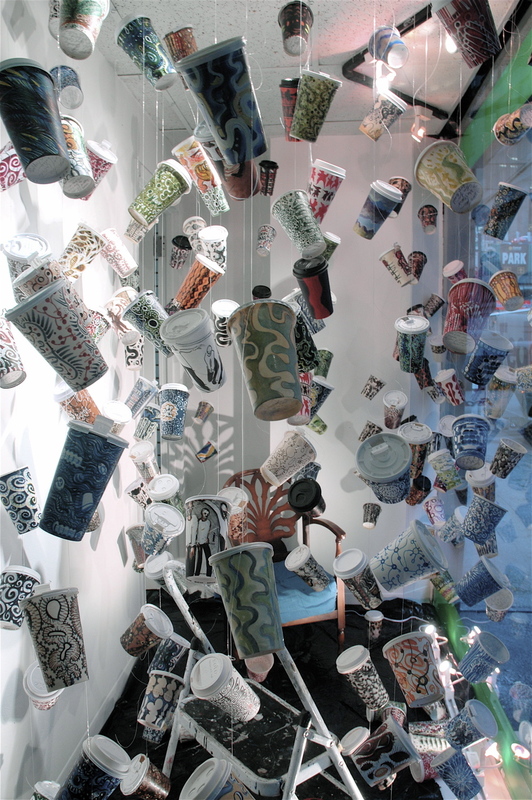 This, I decided, is the perfect material to suspend 300 cups. Decision made. Just over a week until the exhibition opens. Load-in is Thursday. Yes, I am ready to go. With Leech's diverse background in painting, video, ceramics, calligraphy, wood engraving and other printmaking techniques, the cup series began as a casual outgrowth of her compelling urge to draw wherever she is. One day, without a sketchbook handy, Leech used what was available in the moment. 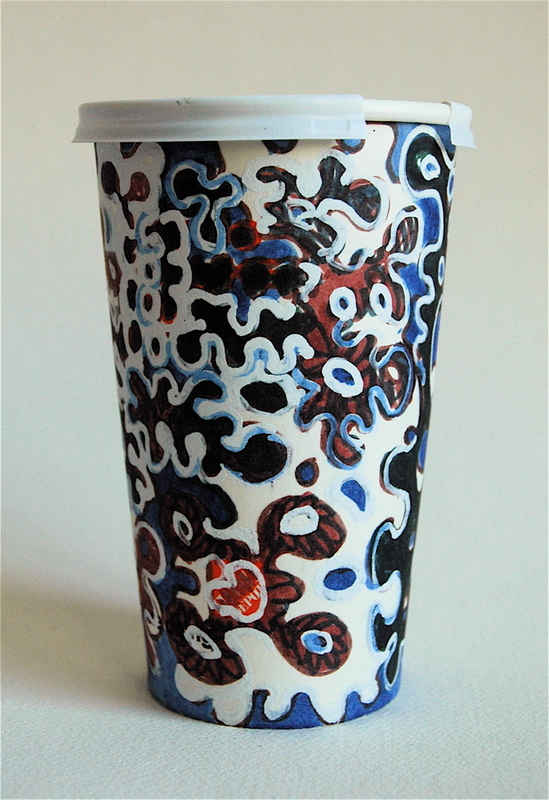 The curved form, challenge of working with existing shapes, colors, and text, and the infinite possibilities of expressive variation became as addictive as the caffeinated beverage the cup once contained. In addition to raising issues of consumerism, post-consumer waste and environmental concerns the cups are essentially about what drawing is: a conversation between mark making and surface. Building, layering and obliterating through memory, observation and working from within, this meditative process begins with an initial response to each cup and takes on a life of its own. Leech's range of subject has no boundaries. Her interest in fractal patterning and the fragmenting and meandering of memory and life itself offers an expansive, flowing, bottomless well of imagery, from figurative cityscapes, flora, fauna, mythological winged creatures, and dance performance to abstracted aerial marsh views, biomorphic forms and purely non-objective design. The list is endless because the work is infinite and ongoing. Unlike working on a flat plane, drawing in the round also affords a connectivity of shapes and continuous movement. 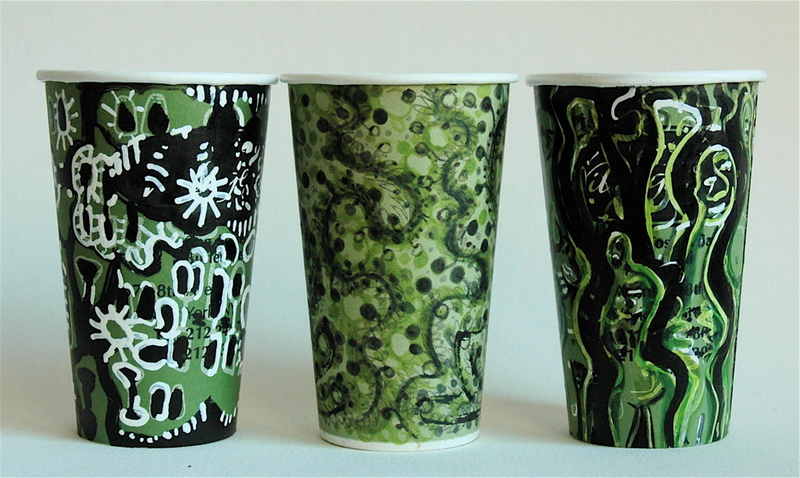 Before any drawing begins, Leech records the date, location and related circumstances on the bottom of each cup after it has been rinsed. Combining traditional and non-traditional materials including Faber Castell brush pens, gel pens, white-out pens, Sumi ink, oil or acrylic paint with encaustic and/or polymer varnish with ultra-violet protection, Leech transforms the ubiquitous paper coffee cup into a chance to hold her imagination and her New York City in the palm of your hand. 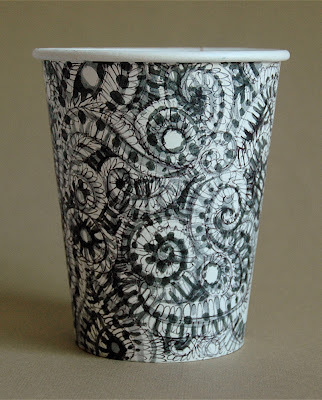 Inspired by the nearly extinct art of letter writing, an integral extension of this project is Leech's blog, Gwyneth's Full Brew, featuring cup drawings along with "vivid New York slice of life stories about the vagaries and incidental pleasures of being an artist in this crowded, expensive, crazy and inspiring city." Throughout the life of Cheryl McGinnis Gallery, our primary interest has been to engage collectors and patrons with a deeper look at the artist's process by hosting interactive gallery talks, artist studio tours, and Art-E, an educational program for children and adults. As one of the first contemporary art dealers to offer this dialogue, our mission is to expand this conversation. 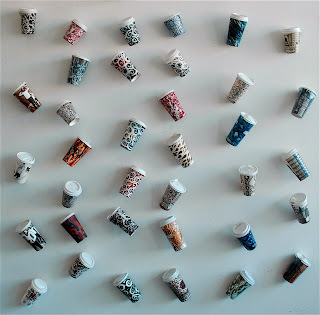 We will open our 2011 season by launching Cheryl McGinnis Projects, a new series of process-oriented installations with related experiential events and workshops that take the artist and viewer outside of the traditional gallery space and into the space and mind of the artist. 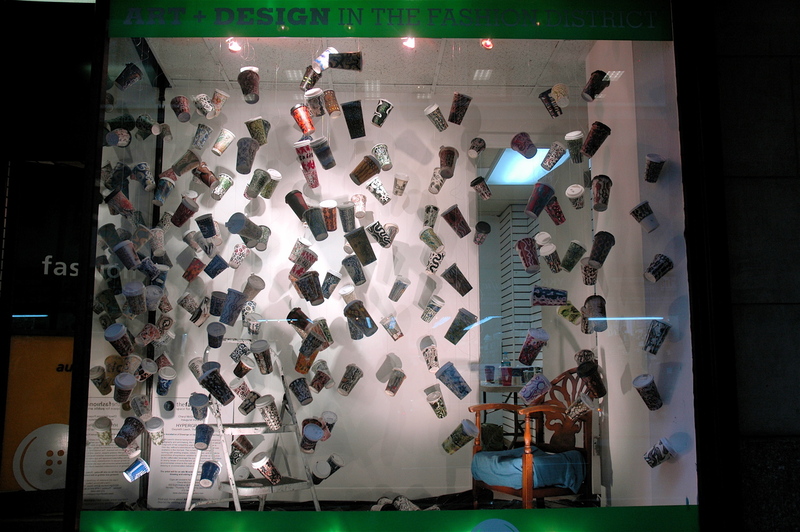 To introduce our first pop-up space, we are delighted to partner with Manhattan's Fashion Center Business Improvement District and Fashion Center Space for Public Arts Program with Hypergraphia: Gwyneth Leech, The Cup Drawings, an installation of 300 plus drawings on upcycled take-out paper coffee cups in the Fashion Center window space at 215 W. 38th Street. With our history of representing work about domestic environment, it seems fitting to begin here. Since people are no longer tethered to homes and offices due to the rapid advancements in wireless and computer technology and the nonstop pace of 21st century life, this exhibit explores how, instead of giving up that domestic sensibility, women create a new one wherever they find themselves. 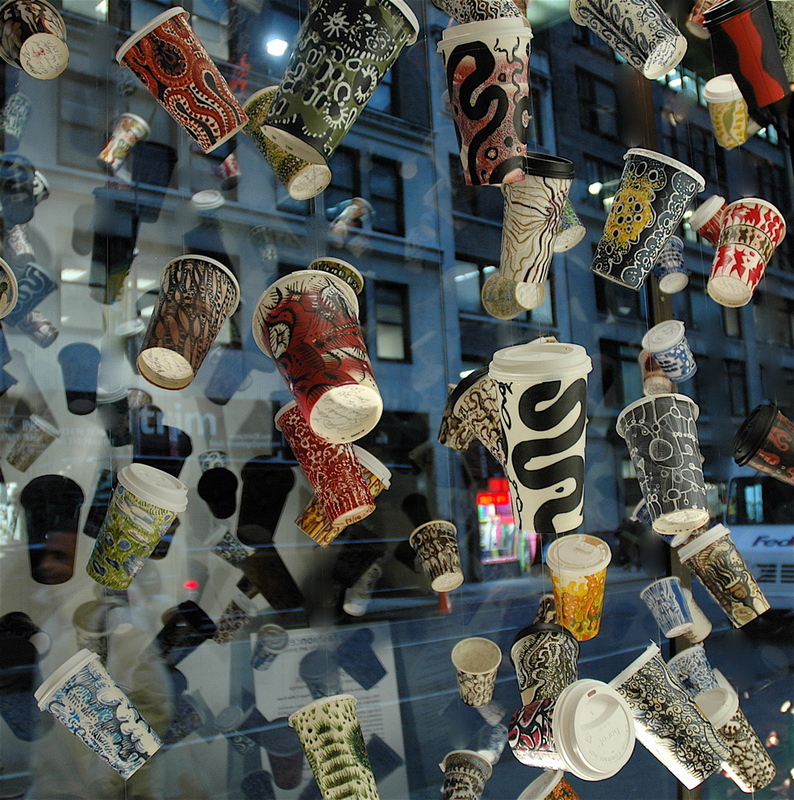 Art integrates with life on the go as passers-by, many with their own take-out beverage in hand, will experience the installation of cups growing and changing each day. Continuing our commitment to arts education, we will host seminars for adults at the Metropolitan Museum of Art, and provide drawing workshops for children with Gwyneth Leech at our gallery space on Saturdays. We feel strongly that the more we expose children to art, not just the making of art in school, but to visual thinking in museums and galleries, and working with professional artists during existing exhibits, the better chance we have of creating future generations of cultured, critical thinking adults, which is desperately needed in a time when young people are spending hours surfing the net , texting and watching reality television. Workshop and seminar schedules will be available at Cheryl McGinnis Gallery, Art-E and on the Cheryl McGinnis and Art E Facebook pages. On a whim, I entered Bergdorf's on 5th Avenue the other day and went upstairs. I look at the windows regularly, never miss them a Christmas. But inside I have not been above the luxury-packed ground floor for decades. I felt a little breathless as I ascended the narrow escalator. day trip from Philadelphia with my mother and older sister. I was no more than 13. We came up several times a year to go to MOMA and galleries on 57th Street. My mother loved beautiful department stores and saved up her money to buy lovely clothes that lasted for decades - classic pieces chosen with an unerrlng eye. In Philadelphia, if she could, she shopped at Bonwit Teller or John Wanamaker's. 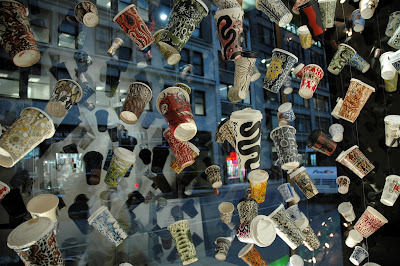 In New York City we only looked at things: art in museums, big buildings, shop windows. Maybe we bought lunch. On this day, after MOMA, we were up 5th Avenue looking in the windows at Bergdorf's, and the dresses were breathtaking - long, silk, simple Empire lines, but exquisitely hand-painted. Mother studied them, absorbed and suddenly we were inside and up the escalator to Dresses on the 2nd floor. We were ushered to a dressing room and a sales assistant carried in several of the dresses we had seen in the window. Up close, they were even more beautiful. I don't remember the designer, but I vividly recall the feel of the peach-colored silk and the intricate painted patterns. "Wow, mom, you will look great in those!" I exclaimed. "No, dear, I want to see them on you." The assistant stood there, holding the dresses. She made no signs to leave, and suddenly I understood - she was going to dress me! I was engulfed in deep mortification. My mother waited, my sister waited, the assistant waited. There was nothing for it. Off came my clothes to reveal JC Penny's undergarments - mismatched, old and full of runs. This was worse than being hit by a bus! The sales assistant was impassive. My mother and sister didn't look at me. Over my head went the dress, and the buttons were fastened. Then it was my sister's turn. She, of course, had on her best underclothes. Clad in floor length gowns, we stood there in front of the mirror, transformed into fashion plates. How much are they? my mother asked. "$3000 a piece," replied the assistant. I was frozen with fear. How would we ever get out of this store? With unruffled calm, my mother said, "Well, I have to ask their father first. Do you have a card?" A few minutes later we were in our own clothes and walking briskly down the street. "Mom, what are you going to do?" I asked, consumed with anxiety. She said nothing. A few blocks away she stopped at a pay phone. Was she actually going to call dad and ask? She dropped in coins and dialed. "I regret that their father says no," was all she said before hanging up. My sister's face filled with genuine disappointment. I felt a surge of relief and admiration; who knew my mother could be so cool under pressure! "Well girls," she said turning to us with a smile, "shall we go get a cup of tea?" I was sitting at the sushi bar with my younger daughter in the Kodama restaurant on west 45th Street. Hispanic sushi chefs were concocting fanciful and brilliantly colored dishes under the stern and watchful eye of a Japanese master. Both my children like sushi, which I never ate until I moved to New York City. They don't stray much beyond California roll, but it is a door open onto exotic tastes all the same. I was nursing a green tea. It was a bright shade of green and as I drank it I realized that I know nothing about green tea. I believe it is green because the leaves are not dried for very long, but does it have more or less caffeine than the black variety? People swear by it, but why? Does it really have any medicinal properties? I generally find it bitter, but this particular cup had a kind of roasted barley flavor. Is this due, in fact, to the presence of roasted barely? Then there is Maté, an even stranger and stronger green brew. People swear by this too. I know that it is South American, not Asian, but is it related to Asian green tea at all? The first time I lived in New York City was in 1993. It was at the end of a youthful 18 month ramble through Africa and Asia (now, there are some tea and coffee stories I need to tell you!) After an uncomfortable month drifting across the United States in culture shock, my husband and I had made landfall in New York City and instantly felt back on an even keel. The whole world was here. We decided to stay for awhile and looked for a short-term rental. 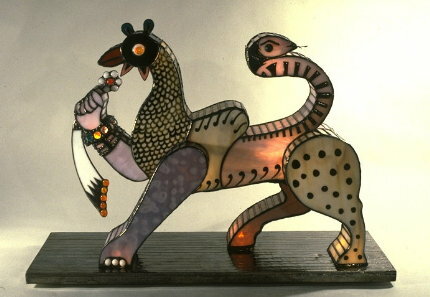 Minouche Waring and Jean-Luc Comperat of 1178 Glass Designs were about to go to India for several months and needed cat sitters. We were delighted to rent their rambling loft at 6th Avenue and 26th Street, full of decorated glassware and mirrors, stained glass panels, tiffany-style lamps and Asian crafts. Over the years, we have stayed friends. (I even appeared in a theater piece with Minouche at La MaMa in 2000. She was dancing and I was drawing onstage.) I was at the loft one day and Minouche offered me Maté. It was her current brew of choice. She drinks it in a small cup, through a silver straw. I gave it a shot, but nearly choked on the bitter taste and the ground tea. You are supposed to strain the tea with your teeth as you drink it through the straw, she explained. Minouche, I love you dearly, but I just can't do maté! Japanese green tea, on the other hand, I actually find rather pleasant. Back at the Kodama, the waitress refilled my cup with steaming green liquid. As I took another sip, I vowed to find out more about what I was drinking. 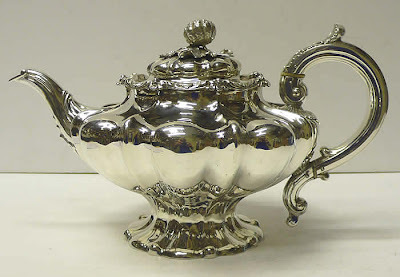 I am imagining Louise Eshleman McCollum and her sister, Mrs. Edith Eshleman Peacock taking tea together in Louise's drawing room in Bloomsburg, Pennsylvania. It is the 1920's but I see them still in stays, voluminous dark dresses, and Mrs. Peacock must be wearing a large hat with a dead bird pinned on top. 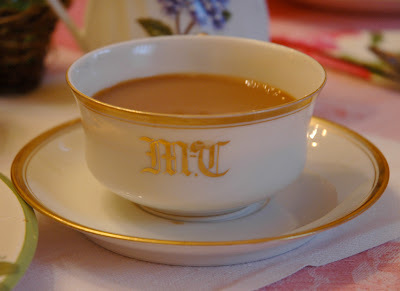 The table is laid with a crisp, monogrammed linen cloth and the china is fine white, with a gold rim and monogrammed too. The tea is poured out from a heavy silver pot. Louise's husband, Alfred Fowler McCollum is an inventor / mechanical engineer and self-made man. He is descended from a long line of Scottish-Americans going back to rebel John McCollum of Argyll, who was thrillingly banished from Scotland to New Jersey in 1685 for his part in an uprising against King James II. Two revolutionary soldiers grace her husband's family tree. For her own part, Louise has a family of whom to be deeply proud. Her father, Benjamin Eshleman operated a coal mine and was a Civil War veteran. Her mother, Elizabeth Pott Eshleman bore 15 children, of whom 13 have lived to be adults, including the sister Edith who sits across from her. But above all, it is her Grandfather Abraham Pott of whom we think: founder of the town of Port Carbon, PA, pioneer industrialist who was famous for finding coal veins, the first to figure out how to burn anthracite in a stove, used it to run the first steam engine in Schyulkill County, built a canal, invented coal car mechanisms and built a railway from studying one in a book, never having seen such a thing in real life. He was born in 1799 and lived to be 96, his life spanning the whole Industrial Revolution. Before him were three full generations of John Potts - all in the iron business and more Revolutionary War soldiers - descendants of Willhem Pott who arrived in Philadelphia in 1734. And to ice the cake, all these fine men of action and industry - husband, father and fore-fathers - were Free Masons right back to 17th Century Britain. So now I am back to imagining that afternoon tea in Bloomsburg. The ladies are not happy. In fact, they are disconsolate. Years ago, Alfred had decided that each of their three daughters would receive higher education. Elizabeth, the eldest, attended the Normal School in Bloomsburg and trained to be a kindergarten music teacher. Martha, middle daughter, went off to Philadelphia to nursing college. And the youngest, Katherine was allowed to go to art school! The School of industrial Design in Philadelphia. What did she do there? She bobbed her hair, donned a racoon coat and became a Flapper. And now a letter has arrived announcing her marriage to Michael Gallagher - a fellow art student - in a City Hall wedding!! Yes, you heard the name correctly - Michael Gallagher, Irish. Even worse, he is the son of a coal miner - not a coal prospector like Grandpa Abraham, not a coal mine operator like daddy Eshleman - but the son of an immigrant Irish pitman. And how can it be, that into this family of staunch Free Masonry should come a Roman Catholic? This is what comes of over-educating young women! I can only imagine how much worse the ladies are going to feel when the first baby - my mother Louise - arrives at full term, several months too soon. It cannot be said that the rift was ever really healed. Katherine and Michael Gallagher, the young artists, managed to be independent, lived on their wits and their skills as illustrators, and had friends who helped them find jobs and places to live. They never left Philadelphia and they never spoke of the past. My mother recalls that her grandfather Alfred McCollum was generous, and had sent the newlyweds dark heavy furniture to fill their home. But of the nature and opinions of my great-grandmother Louise and all of the 12 great-great-aunts and uncles, I can only guess. Direct delivery of Gwyneth's Full Brew posts to your Inbox! I am a painter living in New York City, always on the lookout for the extraordinary ordinary. 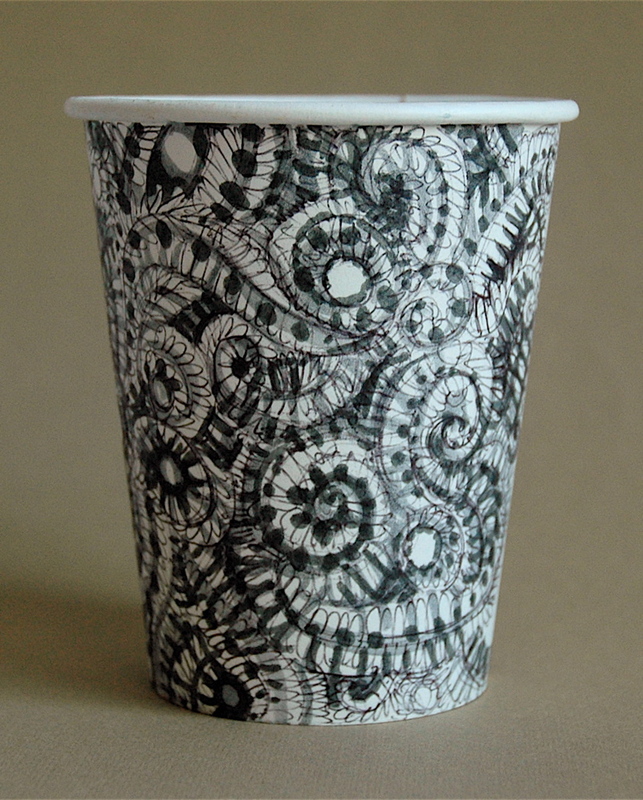 And I draw on my empty paper coffee cups. Empire Coffee and Tea Co.